The Awami Workers Party is Pakistan’s largest and fastest-growing party of the socialist Left. Formed in 2012, it represents an attempt to rebuild, after decades of progressive decline, a popular left-wing party that represents ordinary people and is adapted to the new challenges of the 21st century. Since its formation, the party has worked to reintroduce progressive ideas into a political arena that has shifted alarmingly to the right in Pakistan. It has worked to build movements that challenge the political and economic status quo; for public housing, for land reform, against bonded labor, in opposition to privatization, for a progressive fightback against growing rightwing fascism and terror and in support of women’s liberation amid rising patriarchal violence. AWP has provided unconditional solidarity to movements against enforced disappearances and ethno-national rights, including to the Pakhtun Tahaffuz Movement and movements in Balochistan and Sindh (and now, even Punjab) for the recovery of illegally abducted missing persons. AWP has consistently worked for complete internal autonomy and political and economic rights for the people of Gilgit-Baltistan, because of which AWP leader Baba Jan and remains a political prisoner serving a dubious life sentence in GB to this date. 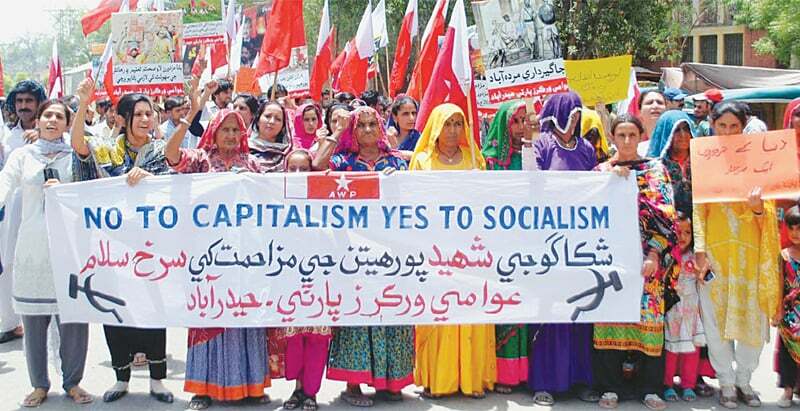 AWP has organized with farmers struggling for the right to land in Okara and Derah Saigol and fought their cases both in the streets and in the courts, for which AWP Punjab leader Ghulam Dastagir spent over five years in jail. For many years, AWP has organized katchi abadi residents against evictions in the long struggle for housing rights in Islamabad, among the results of which was the Supreme Court finally acknowledging the constitutional right to housing and ordering the government to stop summary evictions and make policies for low-income housing. The party has stood with religious minorities being targeted for their faith in an atmosphere of rising religious bigotry and organized against the religious right demanding the de-criminalization of domestic violence against women. It has stood with trade union movements, including those by the workers of PIA and PTCL, against privatization fueled by crony capitalist interests. It has taken up the cases of Pakistani workers expelled from Gulf states and helped return and rehabilitate them in Pakistan. It has stood with students across the country who face mistreatment and repression without any representative platform or union to articulate their interests. Despite the challenges explicit in such a political undertaking in present-day Pakistan – AWP members have faced censorship, violence, arrests, jail sentences and abductions – the party has grown exponentially in the space of five years, with thousands of members in all provinces and nearly 70 districts across the country. In its first foray in the electoral arena, the countrywide local government elections in 2015, the party overcame resource constraints to win 155 local seats across the country, in regions ranging from Buner in Khyber-Pakhtunkhwa to Toba Tek Singh in Punjab, to Nasirabad in Sindh and the capital city of Islamabad. A model of development that is sustainable, ecologically-balanced and prioritizes the well-being of individuals and the environment above the demands of profit. Building on years of organizing and movement-building, the 2018 general election is an opportunity for Pakistani progressives to present a genuine political alternative to the people on the national stage in the form of the AWP and provide a reminder that a genuinely pro-people progressive politics is still possible in the 21st century. Amid widespread cynicism in Pakistan and the monopolization of the political agenda by rightwing forces, the AWP will seek to demonstrate how progressives and ordinary working men and women can break through the status quo and address people’s collective problems if they organize and provide leadership. In standing up electorally to the country’s mainstream parties, the AWP will publicly press them on issues like housing, water, education, health, employment and other basic needs that it has long worked on and force such critical matters on the electoral agenda and into parliament. For this purpose, the AWP requires your support. Elections in Pakistan are dominated by moneyed candidates with billions at their disposal, with no regulation of campaign spending by election authorities. While the AWP’s strength lies in its trained cadres and grassroots organization of working class voters, it cannot hope to compete against the parties of the billionaire elite without a modicum of campaign funds to meet basic expenditures, including campaign materials, media outreach, printing, transport, logistics, administrative expenses, nomination costs and others. Any and all donations are welcome. We are writing to you for assistance as fellow progressives and people invested in different processes of transformative politics around the world, who understand the value of such initiatives in the contemporary age. The AWP will ensure that the funds are utilized with utmost diligence and transparency and will provide accountability for them. The party will keep a meticulous record of donations and send out a newsletter to all those interested, updating on the use of resources and related mobilization and campaign activities. Or send your amount by any means while contacting any one of the four members of the fund raising committee. Our deepest gratitude in advance for help in this process of building a new politics of equality, resistance and progress in Pakistan. Please feel free to get in touch for any queries or further details needed.